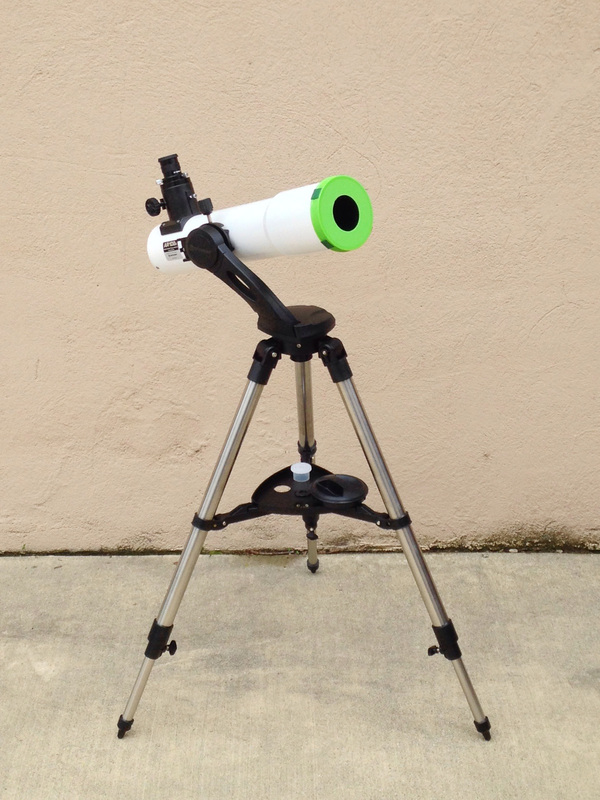 Here’s the Bresser Messier AR102S Comet Edition with a homemade aperture mask. I just converted the scope from a 102mm f/4.5 to a 60mm f/7.7. The first and most obvious is to control chromatic aberration (CA), also known as false color. 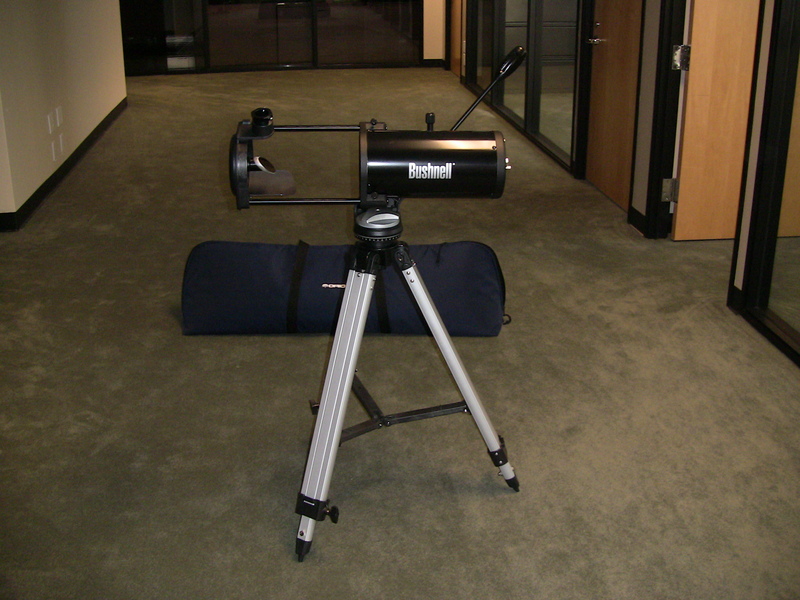 Despite the name ‘achromat’, which literally means ‘no color’, doublet refractors without extra-low dispersion (ED) glass do show some false color, because their lenses do not bring all of the colors of light to the same focus point (they’re still a LOT better than scopes with a singlet objective lens, like those used by Galileo). For dim objects like galaxies, nebulae, and most field stars, the effect is not noticeable, even in large and optically fast scopes like the AR102S Comet Edition (nickname needed). But bright objects like the moon, planets, and first magnitude stars will be surrounded by purplish halos, and may have yellowish margins. In effect, the purple and yellow-orange parts of the spectrum are forming out-of-focus images that are superimposed on the main in-focus image. This, along with mounting considerations, explains why reflectors and catadioptric scopes are progressively more common past 4″ in aperture. 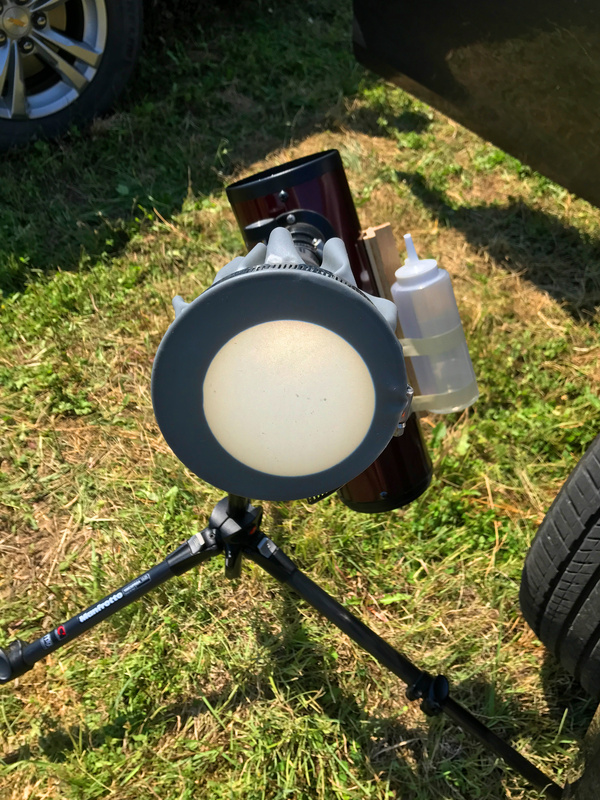 A 6″, f/8 Newtonian will be free of false color (as are all reflectors) and has such a gently converging light cone that it is easy to collimate and to focus – it’s easy for such scopes to achieve ‘planet-killer’ status if the mirror is good. A 6″, f/8 achromat will be a beast to mount and it will show lurid false color on bright objects. But people still make, buy, and use such scopes! Why? 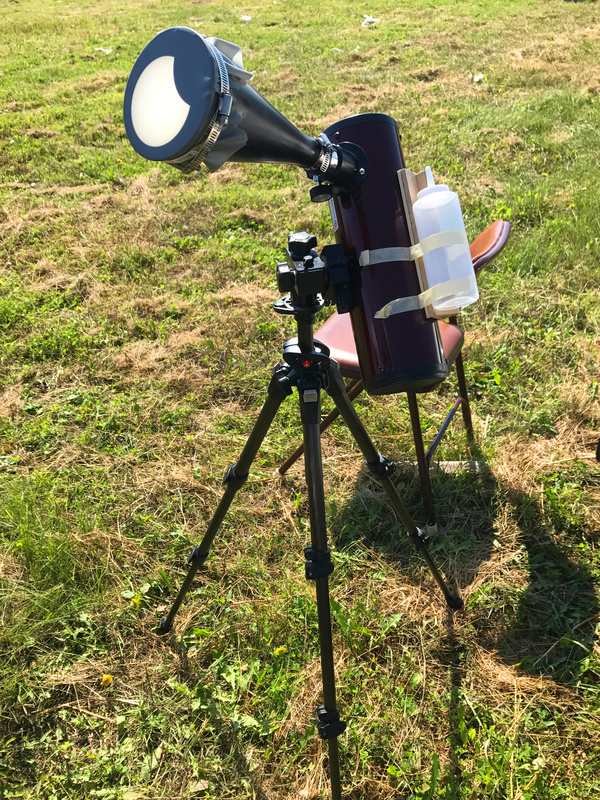 Horses for courses: big, fast achromats can be superb deep-sky scopes, where chromatic aberration is typically not a problem. With the fixed sizes of standard eyepieces, achieving wide true fields requires short focal lengths (not just short focal ratios), and bright images require aperture, which drives the development of large but optically fast scopes like the AR102S Comet Edition. At f/4.5, it is well into ghastly CA territory on bright targets. The other night I stayed up late to catch Jupiter, and in the AR102S the planet wouldn’t even come to a clean focus. It was just a bright ball of light inside a sea of purple. I switched over to London’s 60mm f/11 Meade refractor and Jupiter snapped into a sharp and essentially color-free focus. 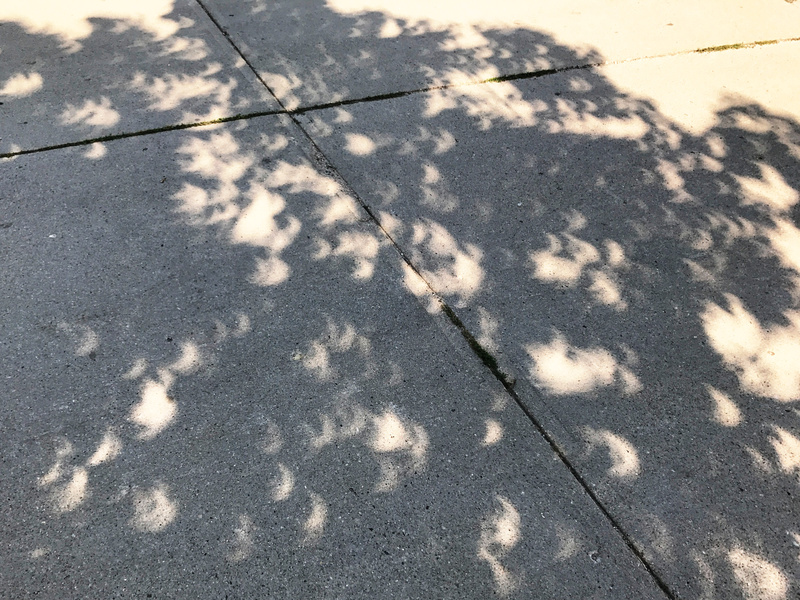 There was a moon emerging from behind the limb of planet, already one moon-diameter out into black space, that was completely invisible in the CA-smudged view of the AR102S. 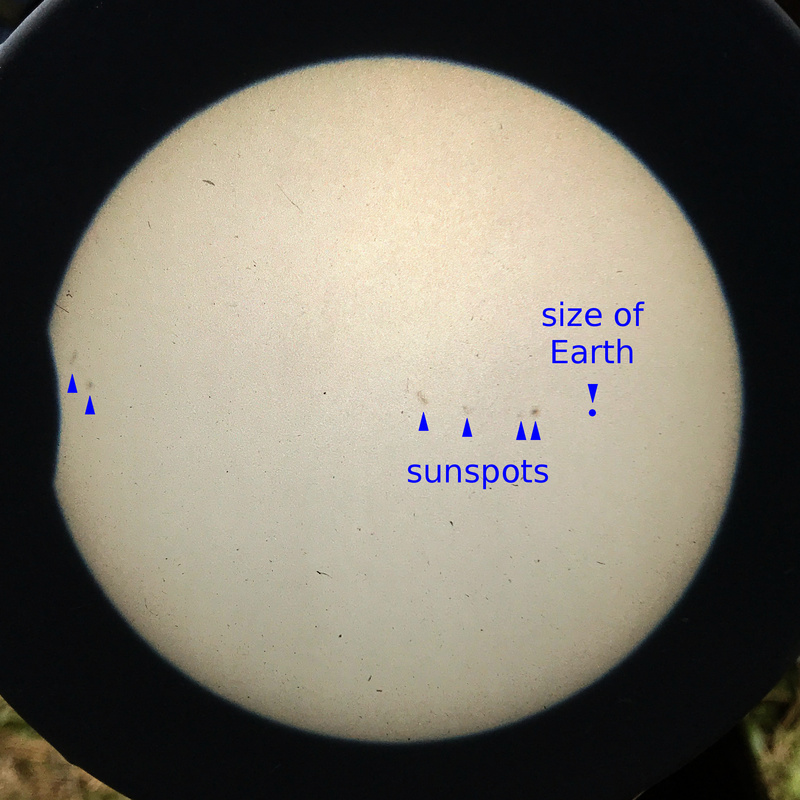 I’m okay with that – as I noted in a previous post, observing bright solar system targets with the AR102S is deliberate misuse of the scope. 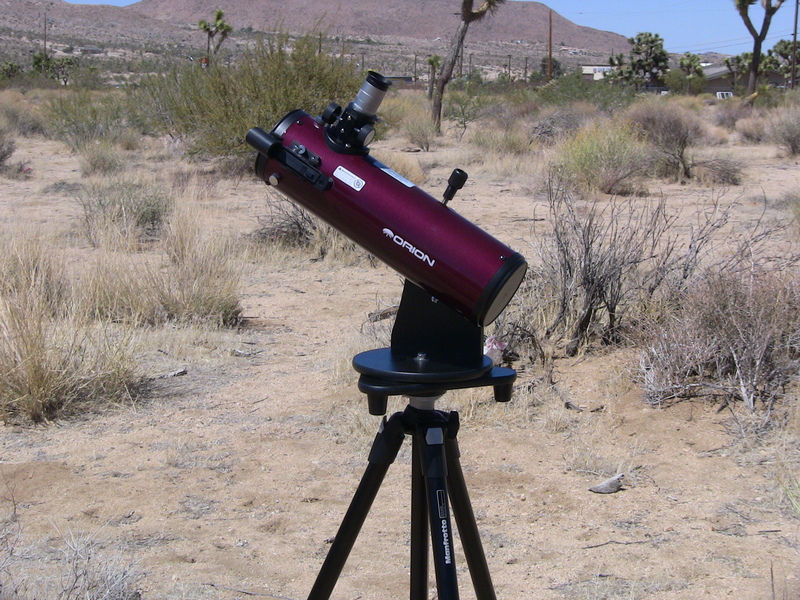 When I want good planetary views, I have a 5″ Mak and a 10″ Dob that can both be pushed to 500x (assuming the atmosphere is steady enough). But their max fields of view are pathetic compared to the AR102S – about 1.1 degrees for the Mak, and a shade over 2 degrees for the Dob, versus 3.6 degrees for the refractor, which is enough to take in all of Orion’s sword at once, with space left over on either side. Still, I’m not going to take all of my scopes out with me every time I go observing, and chances are good that at some point I’ll want to look at something bright even if my main goal for the evening was low-power sweeping with the AR102S. Under those circumstances, it’s easier to have an aperture mask shoved in my eyepiece case than to pack a second scope. Hence this project and this post. 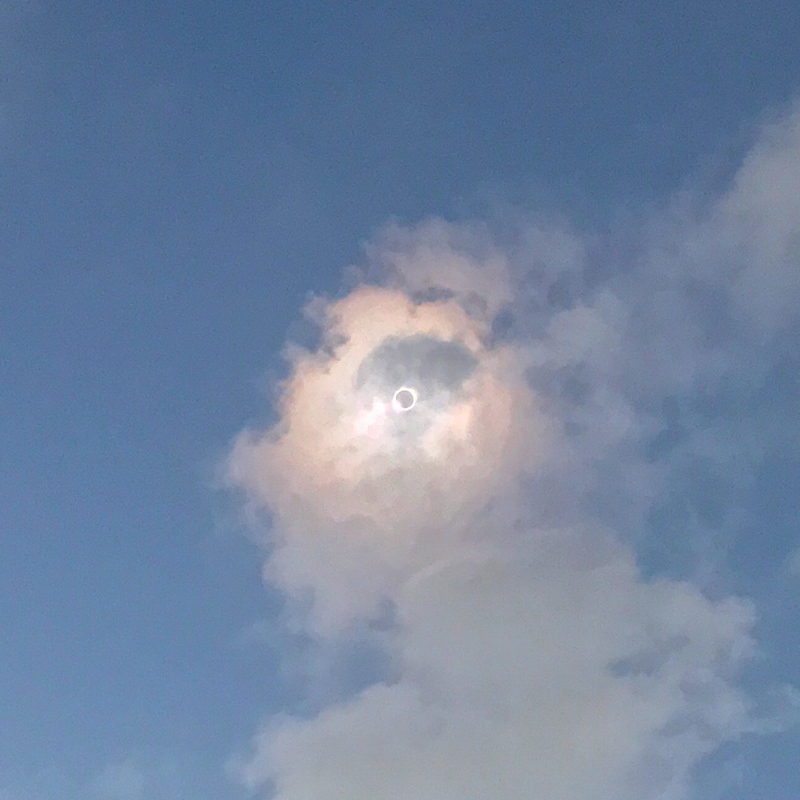 To reduce glare from bright objects. Mostly applies to the moon when it’s full or very gibbous. To give a more aesthetically pleasing image when the seeing is bad. Opinions differ on this point. Some folks prefer to look through a larger aperture despite the increased susceptibility to bad seeing, on the grounds that in the moments when the atmosphere does settle down a bit, you’ll see more detail. I suppose it depends on whether one is in exploration mode or aesthetic observation mode. To make it easier to focus. F/4.5 is a steep light cone, and it’s easy to overshoot the point of best focus. Stopping down the scope makes a shallower light cone, so it’s easier to watch the image transition from out of focus, to near focus, to in focus. I’m going to test this method of finding best focus on some close double stars. 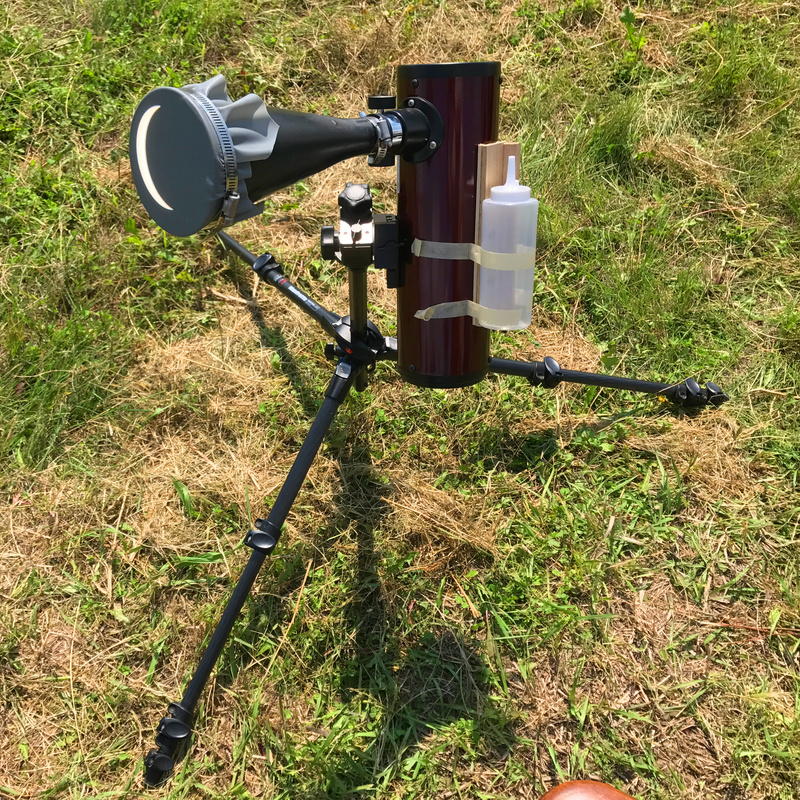 I didn’t want to trade away too much resolving power, so I tested the scope on the moon using cardboard masks of 76mm and 60mm, made from the light cardboard spacers from a box of wet cat food. The 76mm is shown above. Perhaps unsurprisingly, at this aperture and focal ratio (f/6) the view was still unappealingly soft. But 60mm looked good, with minimal CA. This makes sense – the working focal ratio of f/7.7 is a healthy step beyond the f/7.2 that the Sidgwick standard suggests for a 60mm aperture. Going any smaller would be trading away valuable resolution, without significantly improving the image. The light cardboard aperture masks were fast and easy to make, but they weren’t very sturdy. To make a more permanent mask, I needed plastic, heavier cardboard, or foam-core board. So I unscrewed the dewshield from the scope and walked down to the dollar store, where I looked for food packages and storage containers that might fit. Finally on the last aisle I found this 1-gallon plastic jar. The lid slip-fit over the dewshield with just a bit of extra room, which I knew I could shim out with some sticky-back felt. I wanted to make sure the lid would fit before I did the hard work of cutting, so I put the felt on first. This was very familiar – it seems like every other scope I get has a loose dust cover that has to be shimmed to fit correctly. I’ve been slowly chipping away at the same package of sticky-back felt since 2010. 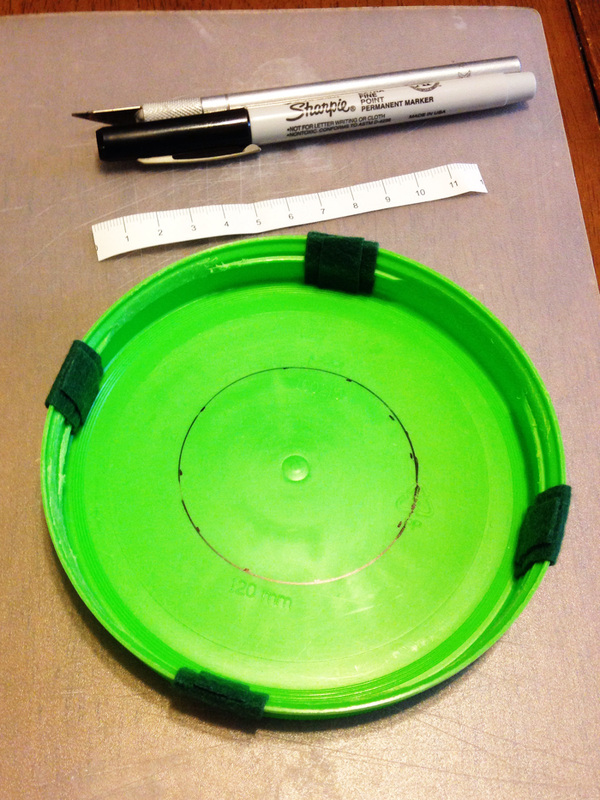 I didn’t have a compass handy, so I used a small paper ruler to make a ring of marks around concentric 60mm circle inside the lid. 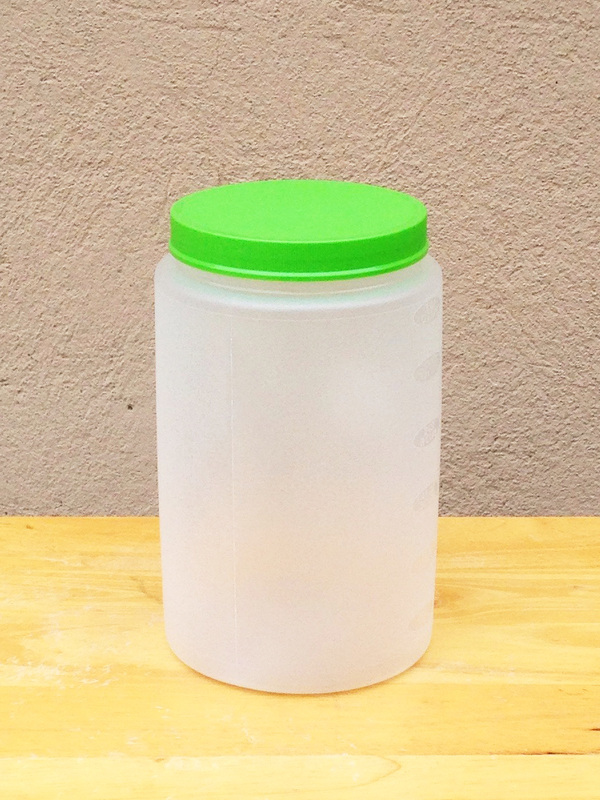 Then found a lid to a jar of vitamins that was exactly 60mm in diameter and used that to trace the circle neatly. I was going to cut out the aperture using hobby knife, but the plastic was too tough. So I moved up to a box knife, and then a linoleum knife. Then I said heck with it and got the Dremel. The hole I cut wasn’t perfectly circular and had rough edges to boot, so I wrapped some sandpaper around a pill bottle to make a tool for rounding out the aperture. Even with the aperture mask, the AR102S is not a champion scope on solar system targets. The C80ED blows it away, which makes sense – it has a 33% resolution advantage over the stopped-down AR102S, and frankly just better glass. But at least the view now is clean and not appallingly degraded. A dramatic way to see the difference is to get a good tight focus on the moon with the mask on, then quickly take it off without removing one’s eye from the eyepiece, and watch the view get a lot brighter and a lot softer at the same time. I have a few more things I want to do. The 60mm aperture mask fits over the end of the scope so securely that it could work as a dust cover, if only I can find or make something to plug the central hole. Also, I think I am going to play with making aperture masks in other sizes, just to see what happens. 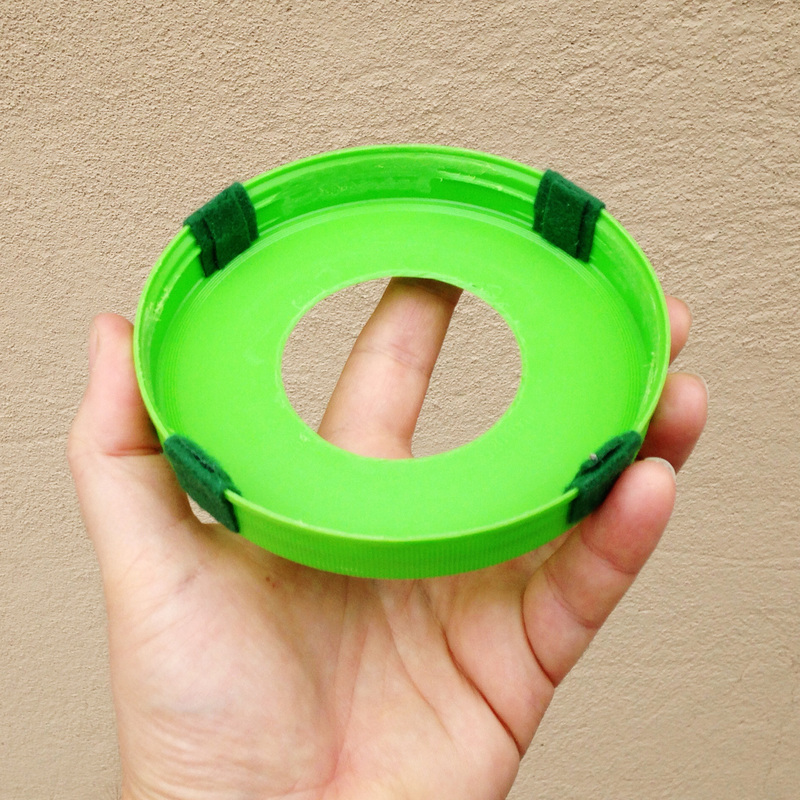 And finally, I have another 4″ scope that will be fun to make an aperture mask for. But that will be a subject for another post. Here’s a fast, cheap, and easy hack that I do to every reflector that passes through my hands. I hate messing around with hex wrenches while collimating my reflectors, so I replace the Allen bolts with standard hex-cap bolts that can be turned by hand and lightly tightened with a socket wrench or pliers. 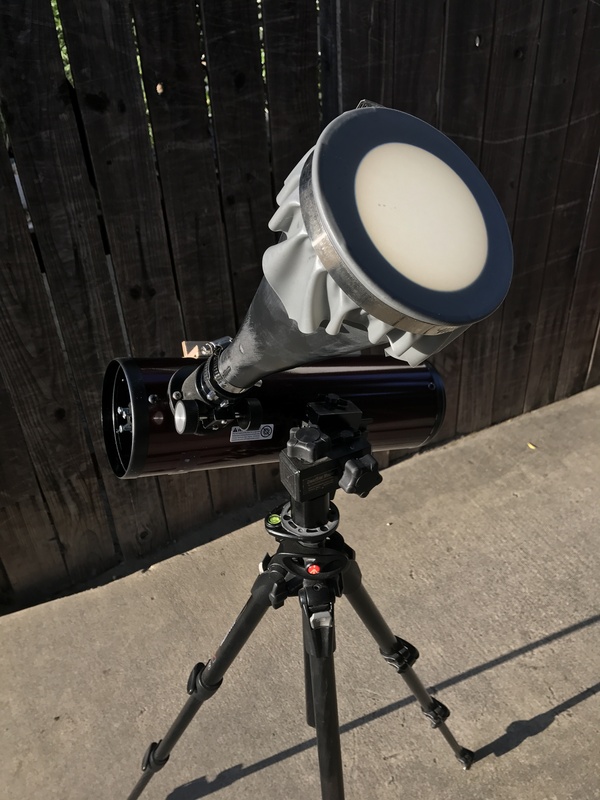 I’ve done the mod to all three of the StarBlast 4.5s that the PVAA has placed with the Claremont Public Library – which I am responsible for servicing every couple of months – as well as to my XT10, my SkyScanner 100, London’s XT4.5, and the 5″ f/5 SkyWatcher Newt I had a few years ago. 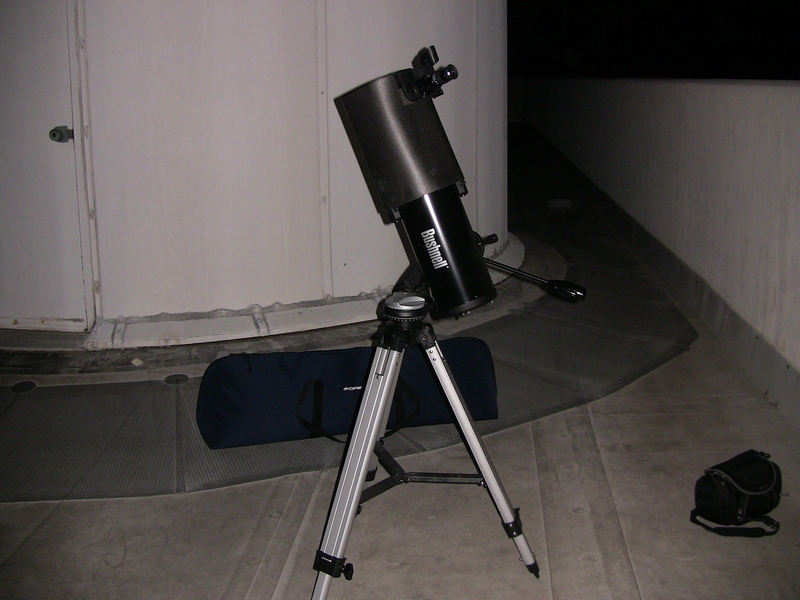 You’ll notice that so far, all of the scopes I’ve done this to have been Synta-made and Orion or SkyWatcher branded. All of the smaller ones have taken identical hardware, but I did the XT10 so long ago I don’t remember – I think it took longer and possibly larger-diameter bolts, but I could be talking crazy. 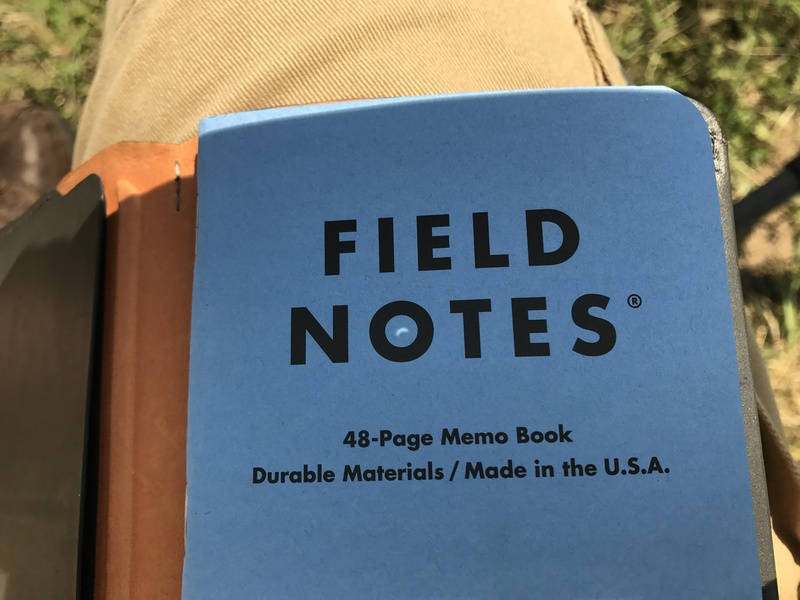 If this is something you’re interested in doing, you need to take two measurements, make a run to the hardware store, and do about five minutes of work when you get back home. Or you can get a set of Bob’s Knobs, which are much nicer and designed for no-tool use. But making your own with hex-cap bolts costs less than five bucks and gives passable results, and doesn’t stop you from picking up Bob’s Knobs later if you like. The first thing you want to know, that you can only find out from your assembled spider/secondary mirror mount, is the length of bolt that you’ll need. The secondary holder has two parts, the hub that the spider attaches to, and the 45-degree-angled mirror holder that is usually attached to the back of the secondary mirror itself with double-sided tape. The collimation bolts engage with threads in the hub, and bear against the flat back surface of the mirror holder. The Allen bolts that the scopes ship with are much shorter than the distance from the mirror holder to the front of the hub. So collimation requires sticking a hex wrench down the hole blindly and fumbling a bit to get it seated in the socket (at least for me – if that doesn’t bother you, this post will probably not be of much use). If you’re going to replace those little shorty Allen bolts with regular bolts, you need to know the distance from the mirror holder to the front of the hub – it’s the dimension between the dotted lines in this diagram, labeled “min. length for bolts”. Your replacement bolts need to have shafts at least this long, or their caps are going to run into the hub before they engage with the mirror holder. It doesn’t really matter how much longer they are, as long as it’s not ridiculous – you don’t want them sticking so far out of the front of the scope that they’ll catch on things or scatter light into the tube. The second thing you need to know is the type of collimation bolt your scope has – its diameter and thread pitch. If you don’t know that, and you probably won’t the first time out, just back one (and only one!) of your Allen bolts all the way out, and take it with you to the hardware store. At the hardware store you’ll find a bolt gauge like this one. Actually you’ll probably find two, one for English hardware and one for metric. 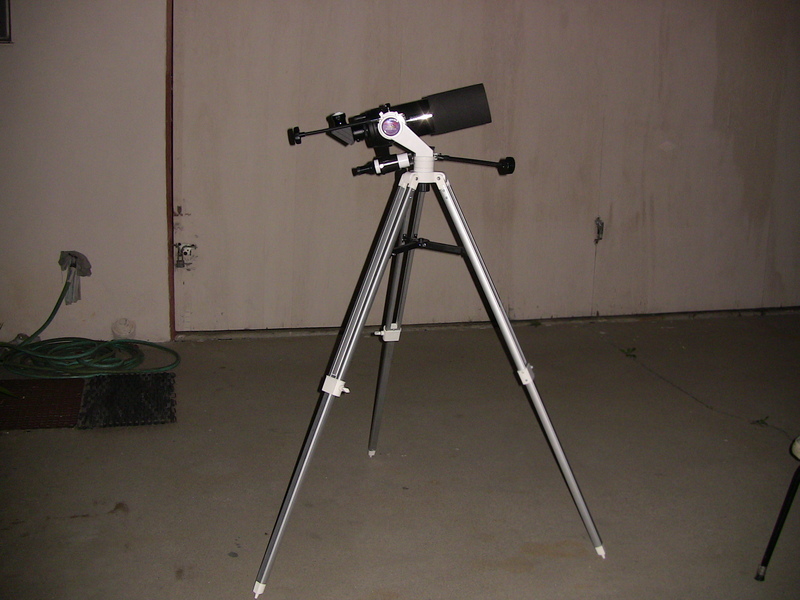 If you have a scope made in China, it probably uses metric hardware, so start there. Here’s a close-up of me testing one of the collimation bolts from the SkyScanner in the metric bolt gauge. As you can see, it fit the 4mm socket. I already knew from measuring the scope’s secondary that I needed bolts longer than 20mm. And here’s my part: a 4mm x 25mm (diameter x length) bolt, part #81494 at Orchard Supply and Hardware. I bought six – three for my SkyScanner 100, and three for London’s XT4.5, which I hadn’t done yet. My motto is “trust but verify”, especially before buying hardware. If unbagging a part to test it in the store makes you queasy, you can just push the end of one bolt through the bag, enough to try it on the bolt gauge. This won’t destroy the packaging should you need to put it back – buy it or leave it, you can poke the bolt back into the package and only leave a tiny hole (in this case, 4mm!). Here are the old bolts ready to go into the bag, which has all of the original Allen bolts from half a dozen reflectors now. I don’t know why I save them. I ‘m kind of an astro-hoarder. If anyone out there wants these, let me know and I’ll send them to you gratis. Anyway, so far, so good. You get home, back out the Allen bolts, and replace them with the hex-cap bolts. Now, this is important: for your sanity, replace the bolts one at a time. If you screw all of the original Allen bolts out before putting in any of the replacements, your secondary is going to be flopping around uselessly. It may well rotate in place and end up not even facing the focuser drawtube. Take it from an idiot who has done this! But if you replace the bolts one at a time and get all of the replacements finger-tight, the mirror will maintain its radial orientation and may even stay in pretty good collimation through the procedure, although of course you’ll want to recheck and touch up the collimation when you’re finished. There are loads of good sources on Newtonian collimation online so I’m not going to reinvent that particular wheel. I’ll just add a couple of tips that have made my life a lot easier. The first is to try to balance the push and pull on the three collimation bolts. In other words, if you want to screw in one bolt, back off another one first. If you only ever collimate by screwing in, you’re going to either run out of travel, jack up your mirror holder, or force it farther down the tube, depending on what the deal is with the mounting bolt (some are spring-loaded, some aren’t). When I sit down to collimate the secondary, I quickly go around to each bolt and turn it both ways, backing out first and then screwing in, to get a sense for what each bolt does. The second tip is specific to these replacement hex-cap bolts on the Orion/Synta scopes that I own and service. Once I get the secondary collimation where I want it by tightening the bolts with my fingers, I go back around and give each one a small additional twist, maybe a sixth of a turn, with the little pliers I keep in my eyepiece box (see here). If I do this evenly to all three bolts, it doesn’t affect the collimation, and the extra bit of tightness helps the scope stay in collimation longer. That might no be needed or even helpful depending on how the mounting bolt engages the mirror holder. Play around with it and see what works for you. Replacing these bolts was just one of half a dozen hacks I made to the SkyScanner 100. The rest will be covered in another post very soon. Until then, clear skies! I’ve been interested in Orion’s SkyScanner 100 tabletop Dob ever since 2012, when I got to look through the SkyScanners owned by Terry Nakazono and Doug Rennie. In particular, the evening I spent stargazing with Doug up in Oregon that October is in my short list of all-time favorite observing sessions. 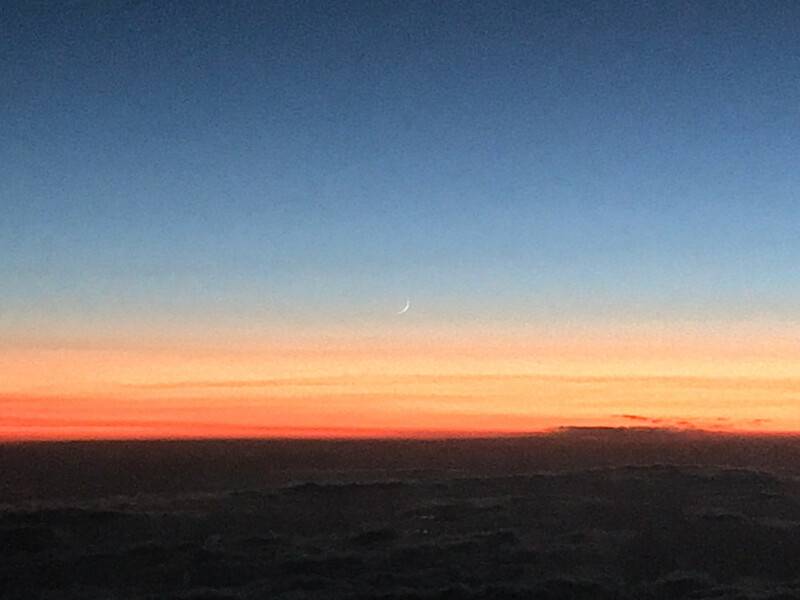 See that observing report here, and be sure to check out Terry’s guest post on the SkyScanner 100 here. After spending literally years contemplating the purchase, what finally tipped me into SkyScanner ownership was my own forgetfulness. On July 3 I was driving to Utah to spend 10 days hunting dinosaurs with friends and colleagues. I knew I’d want some dark-sky time so I packed my C80ED, eyepiece case, sky atlas, and binoculars. About the time I hit Barstow – just too far to turn around and go back – I realized that I’d forgotten to pack a mount and tripod. So my choices were to roll with binos only, or come up with Plan B on the fly. The number of dedicated telescope stores on the direct route between Barstow and Moab continues to hover near zero. However, I was already planning to pass through Flagstaff, which has the Lowell Observatory, which has a gift shop. 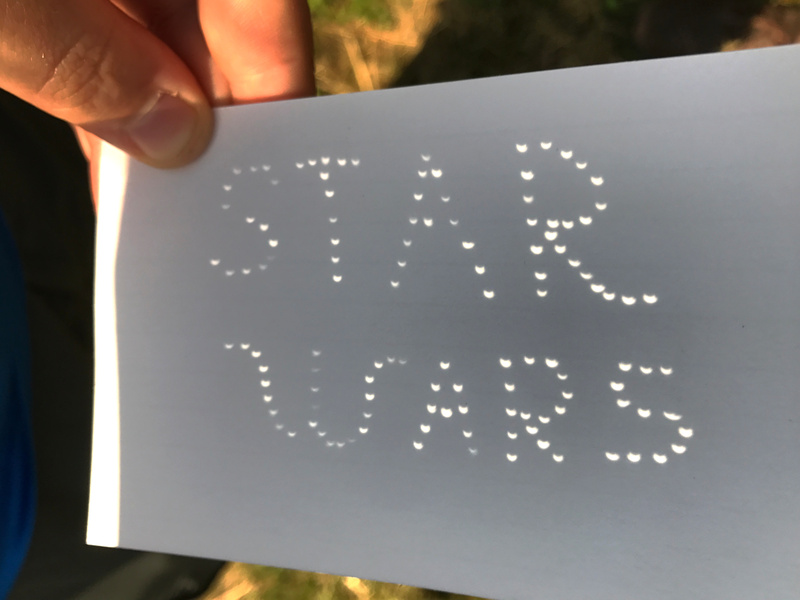 I called ahead: did they have any telescopes in stock? Why, yes, the Orion XT8 and SkyScanner 100, and both were 10% off as part of a holiday weekend promo. Not long after, I had a SkyScanner in the back seat of the car and a song in my heart. Demonstrating how the SkyScanner can ride on any tripod with a 1/4 or 3/8 bolt. I spent that first night in Bluff, Utah, after having driven through Monument Valley, which I’d never visited before. 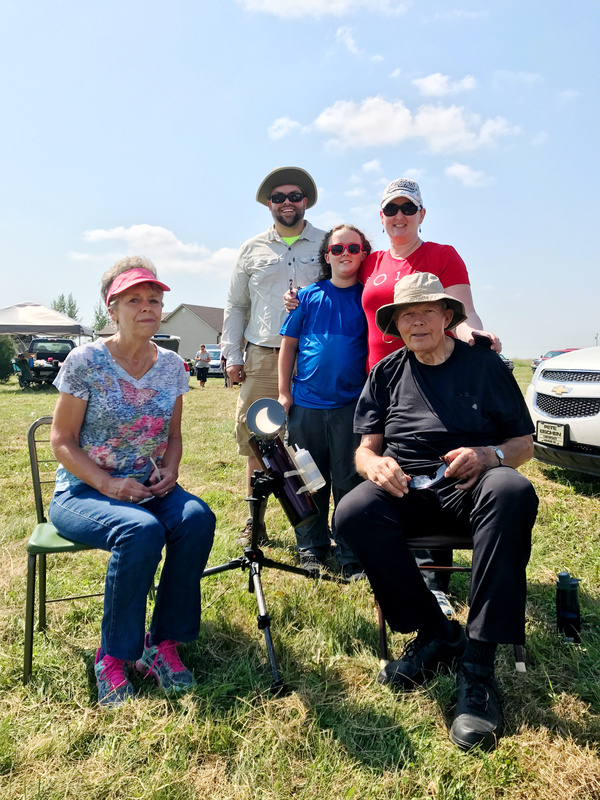 Bluff is truly remote – the nearest towns with more than 5000 people are Moab (5046), 100 miles north, and Kayenta, Arizona (5189), 68 miles southwest. So the skies are inky dark. I rolled in pretty late and I really needed to get some rack, but there was zero chance that I was going to pass up first light for the SkyScanner under those jet-black southern Utah skies. 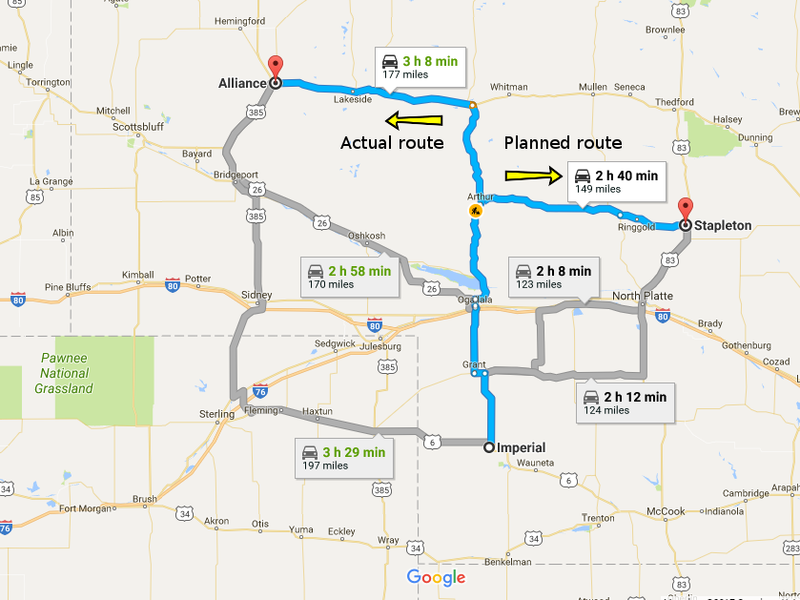 I drove about five miles outside of town and pulled over on a dirt road. The sky was just incredible, even better than out on Santa Cruz Island back in June. Again, the Milky Way looked like an astrophoto and the Messiers in Scorpio, Scutum, and Sagittarius were almost all naked-eye visible (minus a few of the minor globs). I did look at a handful of things with the SkyScanner, and they all looked fine, but honestly I spent more time with my 10×42 binos and even more time than that just staring around with my naked eyes. 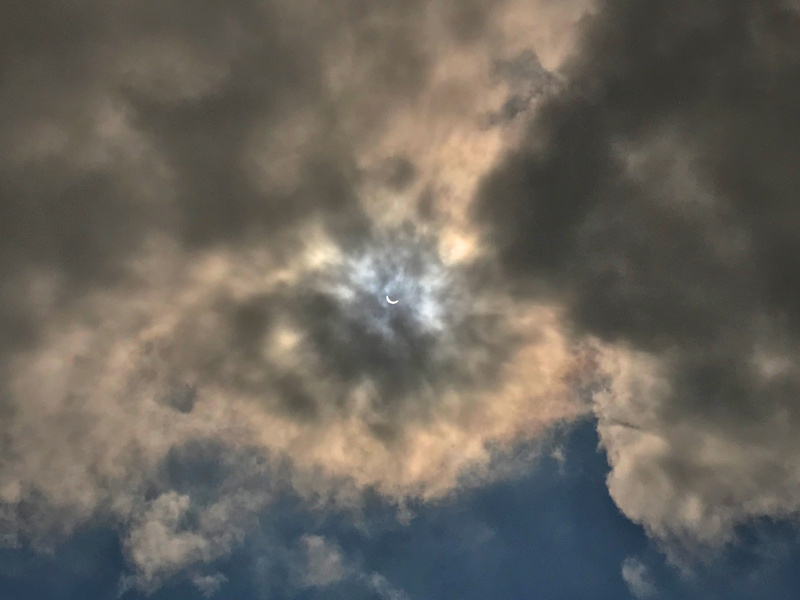 In skies like that, a telescope can almost be a distraction. Still, I’m glad I got that first light session in on the evening of the 3rd, because opportunities would be thin for a while. I did set up the scope on the 4th of July, on the trunk of the car in the driveway of my friends’ place in Moab, and we looked at a few things, but everyone was pretty pooped after a day of hunting dinosaurs and partying so we didn’t push very late. And after that, the sky was at least partly cloudy for most of a week. Finally on the evening of July 10th we got nice, clear skies. I drove out southeast of Moab on the La Sal Loop Road with a couple of new friends and we spent a very pleasant couple of hours rocking through the best and brightest. The SkyScanner performed like a champ. Karl Rijkse (center) shows his heirloom German binoculars to Howard Maculsay (left) and me. I’ve only had it out a couple of times since betting back to Claremont, both times for quick peeks. As a grab-n-go scope it is, as far as I’m concerned, unparalleled. With an assembled weight of just over 6 lbs, it is the definition of a one-hander. The tabletop tripod works great, very smooth, and the rubber feet provide a good grip even on the precarious edge of a sloping car hood. And it goes on my Manfrotto tripod (3.5 lbs) for a 10-pound setup that’s perfect for a long session seated or standing. 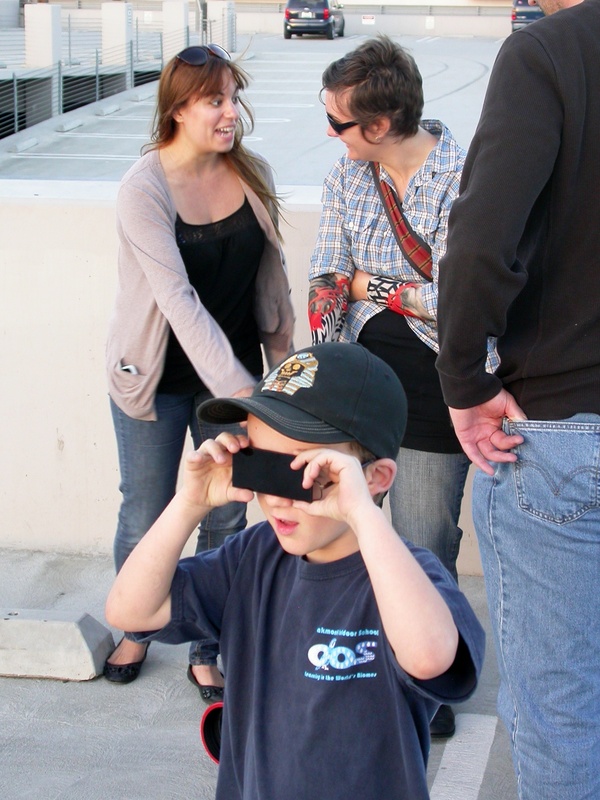 As you can see from the photos (kindly provided by Terry Nakazono), I took the SkyScanner to last Friday night’s meeting of the Pomona Valley Amateur Astronomers, where it drew a lot of interest. 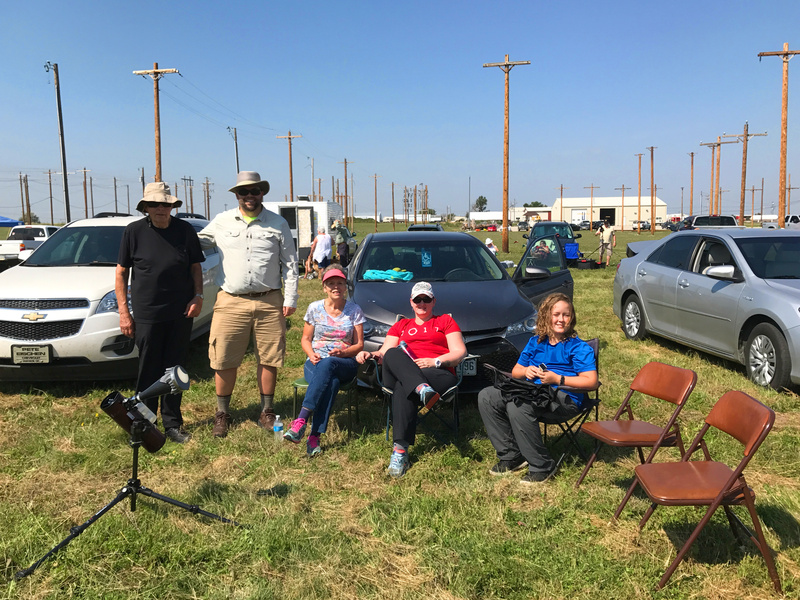 I was going to set up the scope outside after the meeting so we could all have a look at Saturn, but the night sky was almost completely blocked out by smoke from the wildfires and the air quality was terrible, so we packed it in. 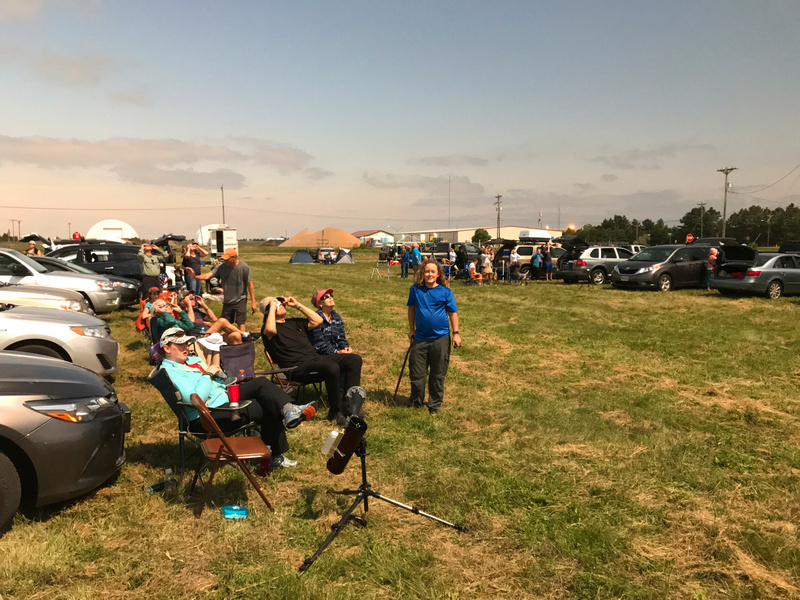 I think I’ll get in the habit of taking the scope to meetings so we can do a little observing after – it’s always seemed to me that an astronomy club should have at least one working scope at each meeting. Here’s my number one thought regarding the SkyScanner 100: how extremely stupid of me not to have gotten one sooner. If you’re interested in this scope and you’re on the fence, just do it. Heck, if you’re shopping for a big scope and you’re not sure what you want, get a SkyScanner to keep you busy in the meantime. 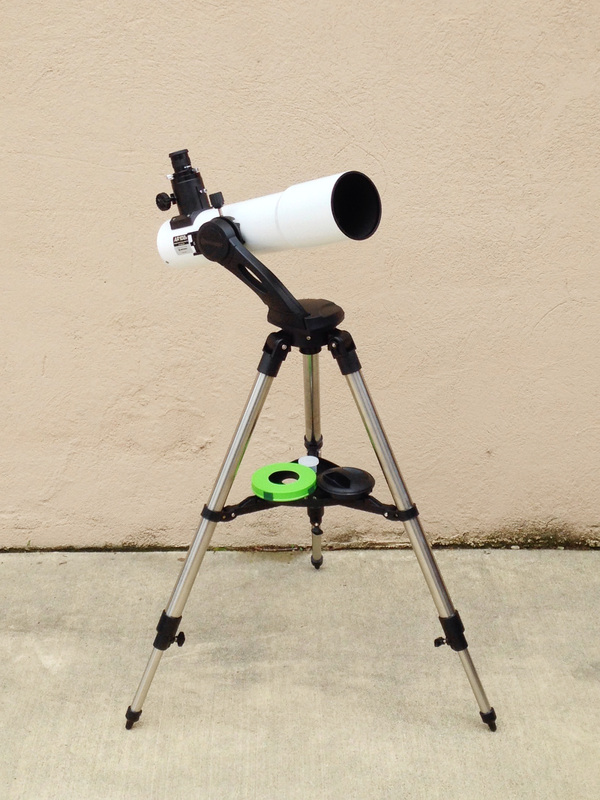 It’s an insane amount of scope – and mount – for a little over a hundred bucks. 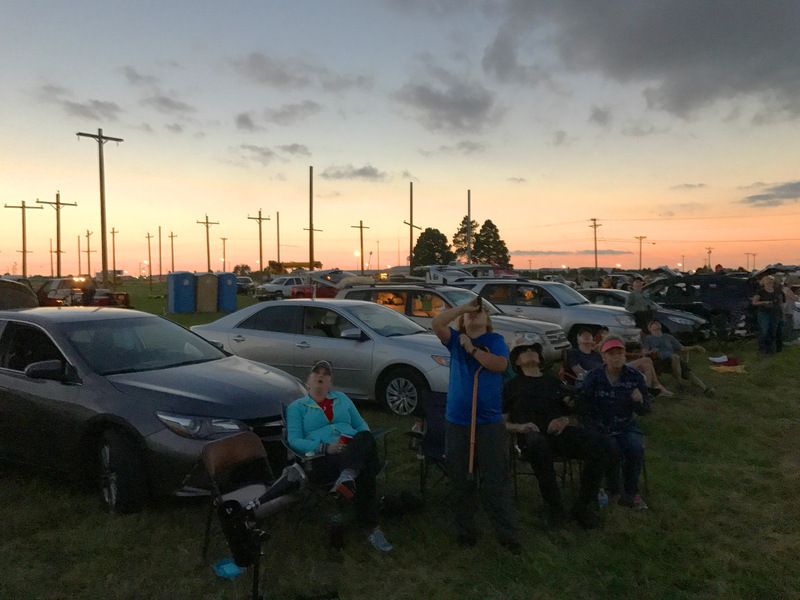 Here’s the first guest post by frequent commenter and dedicated deep-sky observer Terry Nakazono. Actually “dedicated” is an appalling understatement, since Terry regularly challenges himself and his scopes by (1) observing faint deep-sky objects, mostly galaxies, (2) with small scopes he can carry on public transportation and by foot, (3) from light-polluted skies in and around Los Angeles. 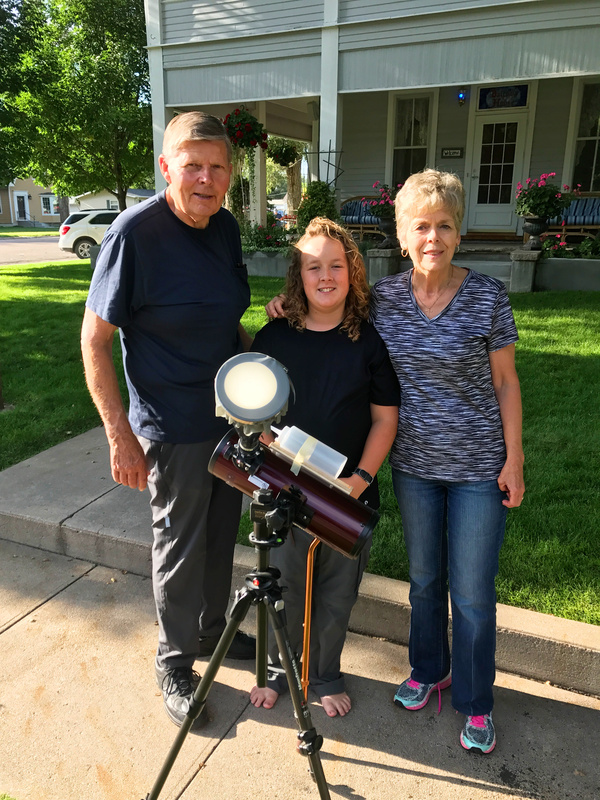 I’ve been looking forward to reading about Terry’s scopes and his observing techniques, so this guest post is most welcome–hopefully there will be more to follow. I’ve been using the Orion SkyScanner the past 2 years for nearly all of my deep-sky observing needs because it’s so easy to transport and set up – crucial if you rely on public transport and your own two feet to get to darker sky sites. 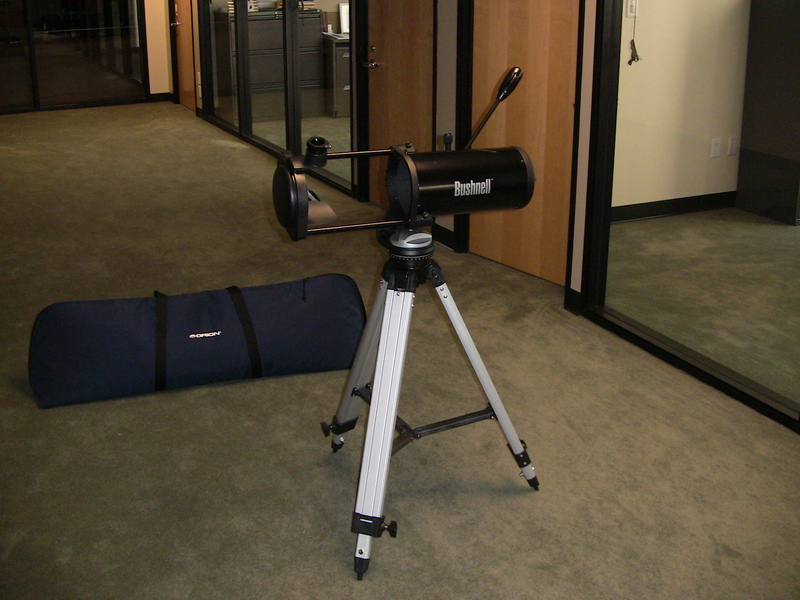 For a package weighing in at 6.2 lbs with scope and mount combined, 100mm of mirror is a lot of aperture. Both scope and mount fits snugly in this Adidas Schmidt backpack. All that’s needed is a tripod to attach the mount to, and a solid Manfrotto weighing in at only 4.5 lbs. (but with a 15.5 lb. weight load capacity) provides a strong, stable support. 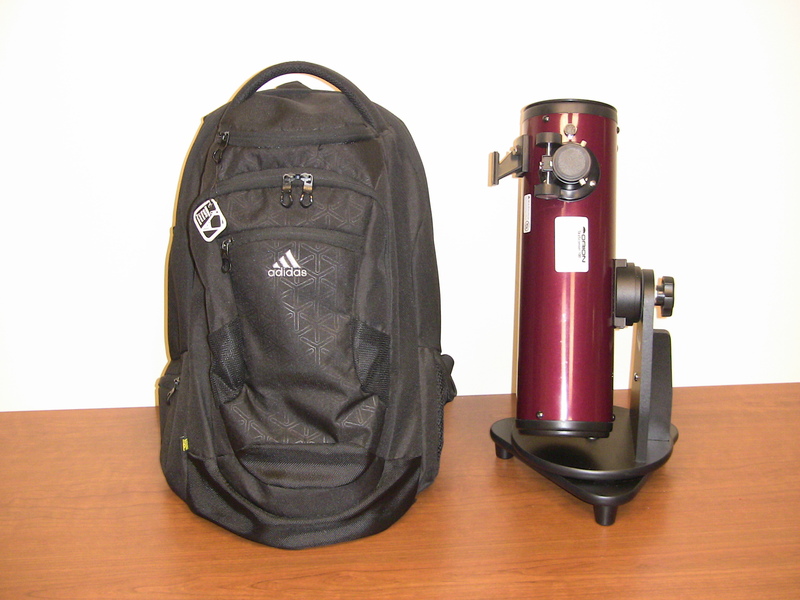 Factor in the eyepieces, star charts and other accessories, and you’re only transporting about 12-13 lbs. of equipment on your body. By comparison, the Orion StarBlast 4.5 weighs 13 lbs, while the Orion SkyQuest XT4.5 is 17.6 lbs. Both cost about twice as much ($199.99 and $239.99, respectively) as the SkyScanner ($109.99) and both add only 14mm of additional aperture to the mirror. As Joe Roberts says, you will not likely find a scope that will show more for the cost. 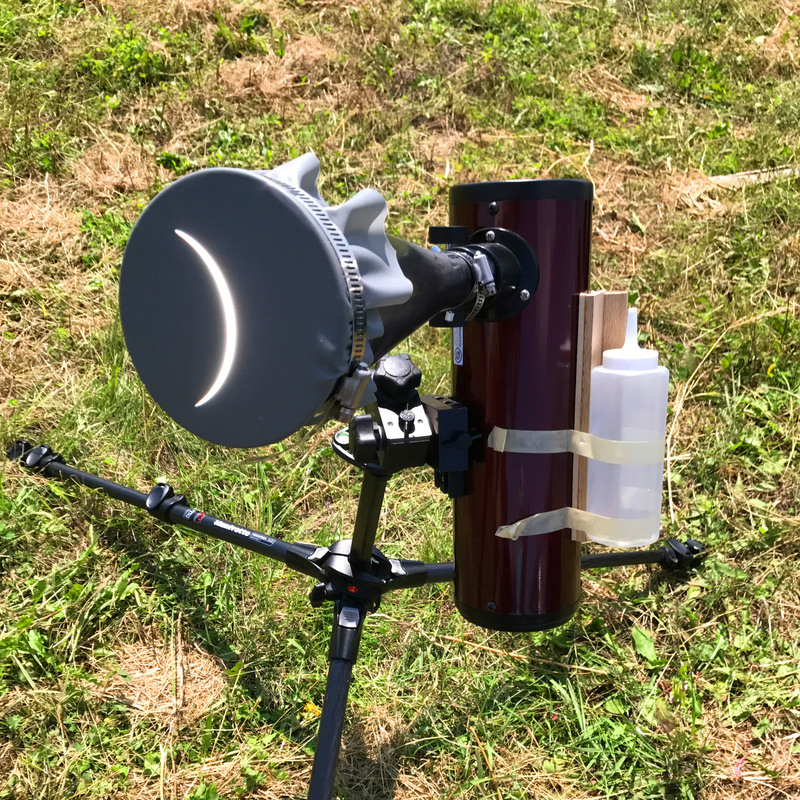 For deep-sky work, superb optics isn’t as critical compared to planetary and double star work, so a 100mm Newtonian reflector works well (for me). 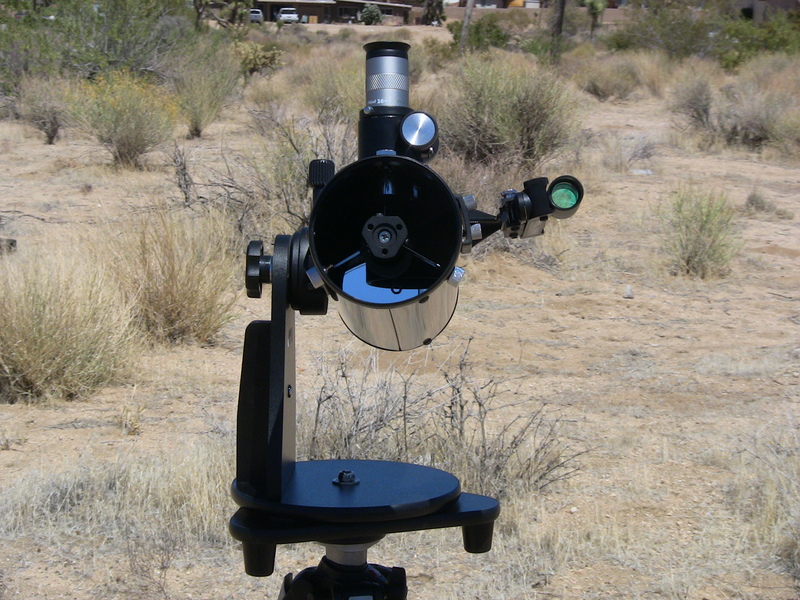 Despite not having a collimatable primary mirror, collimation can be achieved by center spotting the primary mirror and adjusting the tilt on the secondary with the help of a collimation cap, significantly improving the views of the planets and double stars as well as deep-sky objects. Here, you can just see the notebook reinforcement ring I put on the center of the primary mirror; the secondary mirror is collimated by adjusting the three allen screws surrounding the main screw in the center of the secondary holder with an allen-head screwdriver. Having said all that, I’m no longer wedded to the SkyScanner as my sole dark-sky instrument. I now have an Orion shoulder bag that I can carry my Orion VersaGo II mount and Bushnell Ares 5 in. I also have a Vixen Mini-Porta mount which will support my Celestron C90 Maksutov-Cassegrain (C90Mak, top) and Orion ShortTube 80-A (ST80A, bottom) telescopes. 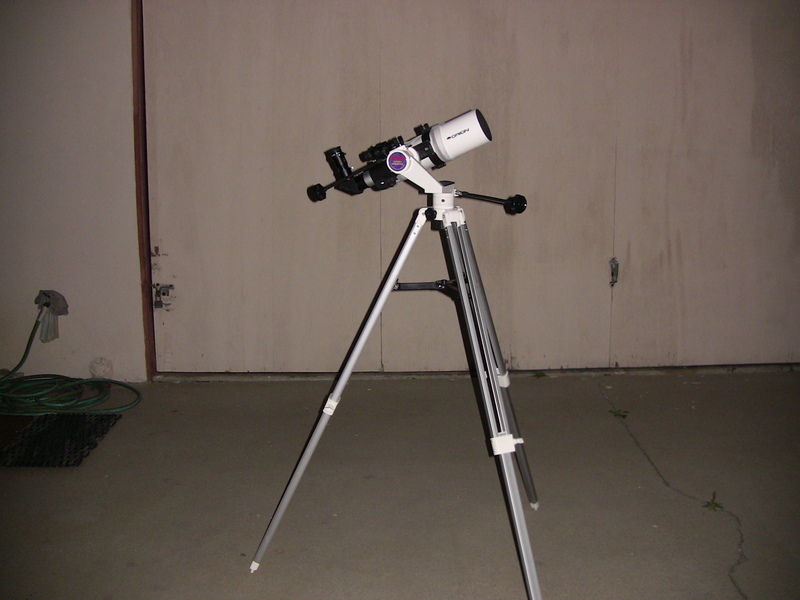 I just ordered a smaller Orion shoulder bag that will carry the aforementioned mount and one of these two scopes. These Orion bags are ergonomically well-designed and make it easy to carry both scope and mount over your shoulder without causing major strain. I suspect that despite their better optics, both the C90Mak and the ST80A will not allow me to see “deeper” into space (i.e. detect fainter objects) than the SkyScanner. But I’ll need to perform a “shoot-out” between these scopes outside of light-polluted urban skies to confirm. 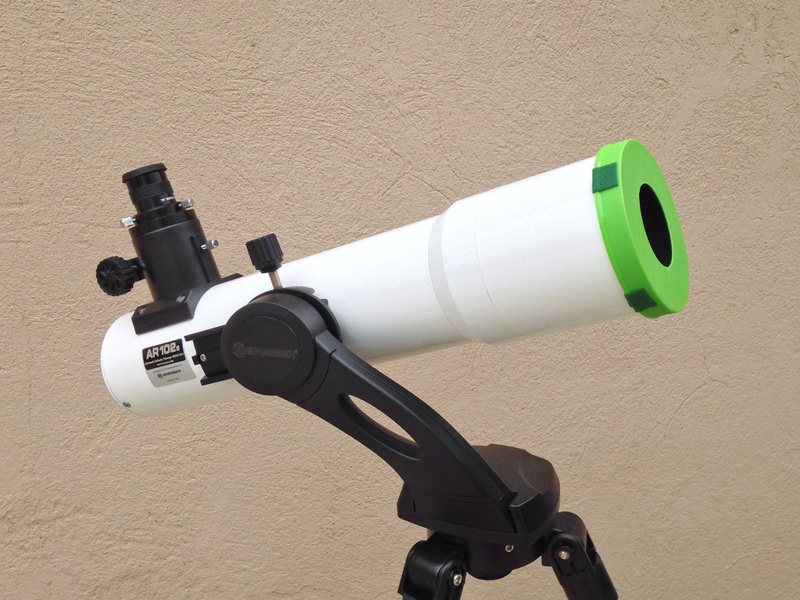 Right now, I see the collapsible tube Bushnell Ares 5 (BA5) as the scope that will eventually replace the SkyScanner as my deep-sky instrument once I’ve gone as far as I can with the latter. 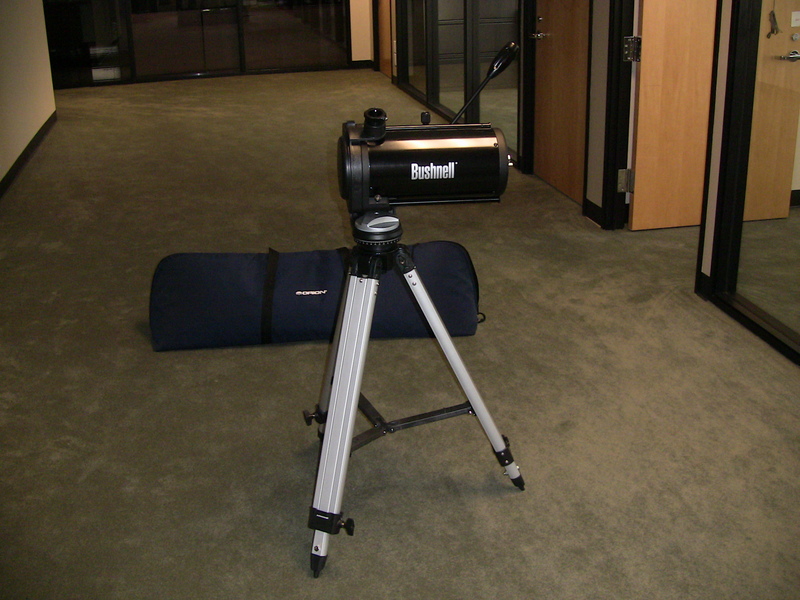 This is an F/5 130mm Newtonian which thanks to its unusual design, weighs only about 6.5 lbs. for the OTA. At only $164.99 (with no shipping or sales tax) from Optics Planet, this is probably the best scope deal in the country right now. Here is the scope with the tube collapsed, mounted on an Orion VersaGo II (because of its bulkiness, I’ve discarded the 6.5 lb. 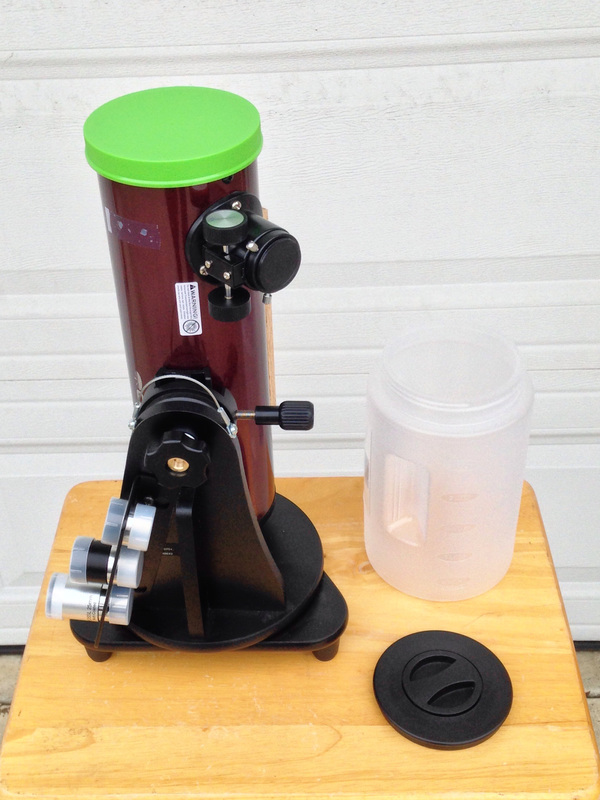 tabletop mount that came with this scope). And here is the scope with the tube extended all the way out. 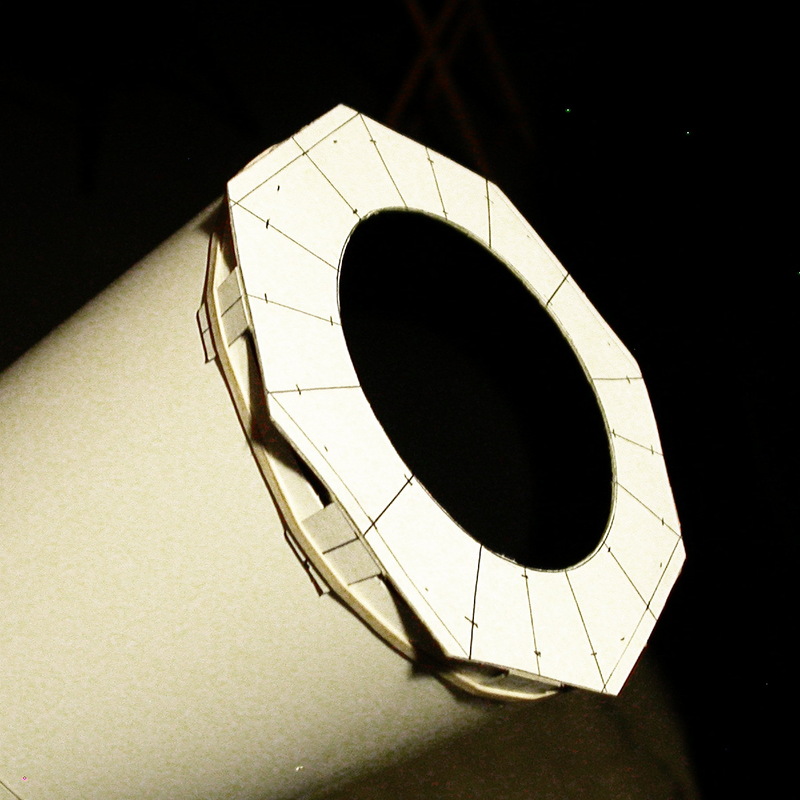 I’ve created a light shroud made out of black felt to cover the open tube and protect it from the elements while observing. In the limited amount of time I’ve used this scope in both light-polluted and semi-dark skies, I’ve had a tantalizing taste of what 130 mm. of light gathering power can show. In my light-polluted front driveway with direct vision, I was able to see the ring shape of M57 for the very first time, using only 65X magnification. With the 100mm SkyScanner, I can barely make out shading within the interior of the oval-shaped disk at 80X or more using averted vision in darker skies. Less than two months ago, I took my BA5 out to a semi-dark (orange-zone) site for the first time. M13 looked nothing like the views I saw through the SkyScanner – at 130X, this globular was just exploding with stars all over the place. Ditto for M5. 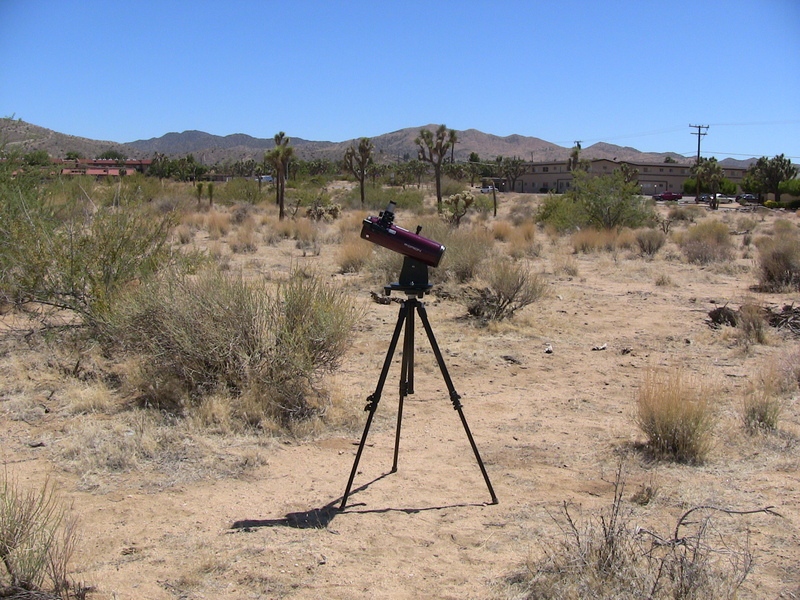 As Matt has shown us through his reports on using “Stubby Fats” in the desert, you can do some serious deep-sky observing with a 130 mm F/5 Newtonian in semi-dark or dark skies. But the BA5 has to wait until I’ve exhausted all the possibilities of the 100mm F/4 SkyScanner. You are currently browsing the archives for the SkyScanner 100 category.